Jim contributes a terrific article to "The Complete Handbook" with some truly insightful tips on how to create authentic dialogue. HALLIE: Love your advice, Jim, especially “Pour it out like cheap champagne.” What did you mean by that? JAMES SCOTT BELL: We all remember those New Year's Eves, or weddings, where the champagne flowed freely. The guests all looked happy, didn't they? They were talking it up, laughing it up. In the moment. When you write dialogue, one of the best ways to go about it is to let it flow without too much thought. You can always edit later. The free form pouring out will get you things you didn't anticipate, just like those champagne conversations at the New Year's party may have got you the love of your life, or a new, good friend. HALLIE: One that’s counterintuitive is “cultivate silence.” I know you don’t mean to leave blank space on t he pages in place of dialogue. Can you give an example? 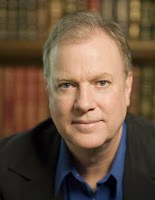 JAMES SCOTT BELL: What I mean is, think about silence as a response from time to time. Substitute an action instead. The story I reference in the Guide is Hemingway's "Hills Like White Elephants." He makes masterful use of silence, in the way the character reacts: looking at a table leg, reaching out for a beaded curtain and so on. We too often think of putting words in mouths as the only way to respond, and that's wrong. HALLIE: Can dialogue be just a bit too clever for its own good, and how can you (as the author) tell? JAMES SCOTT BELL: Absolutely. Dialogue that jumps too far off the page can seem forced. On the other hand, I'm all in favor of polishing bits of dialogue so it's fresher, even memorable. There is no scientific way to measure it, of course. I would ask a couple of questions. First, is it completely natural for the character? It has to sound like this is what that character would say at that moment, even if it's elevated. Second, how does it sound out loud? Often, saying the words will reveal weaknesses, and "too clever" may be one of them. HALLIE: What mistake do you see new writers most frequently make in writing dialogue? JAMES SCOTT BELL: Too often writing dialogue in complete sentences. Trimming out a word or two will sometimes work wonders. Also, too much "on the nose" dialogue, meaning direct response followed by direct response. While you shouldn't avoid it altogether, it does help sometimes to do what I call "the sidestep." Be a little indirect in response, or give a sudden punch, or answer a question with another question. There are various techniques that work. The nice thing is that anything "off the nose" creates an immediate sense of conflict. Why'd the character answer that way? Reading interest goes up. HALLIE: Can you tell us what you’re working on now, and do you find as I do that it’s harder to take your own advice than it is to give it? JAMES SCOTT BELL: Great question. I think about this all the time. Teacher, teach thyself! I must admit that it's easier to be objective when you're looking at other work besides your own. But I do find things becoming second nature. When I write dialogue, for example, I do use the tools I've come up with, and do so somewhat naturally. I guess I've finally drummed some of that into my own head. I'm entering the home stretch on the first draft of a novel. I can't slow down for too much reflection. I write and I trust. I'll go back over it, though, and fix things later. That's really what all this writing technique should be about. When you write, write like the wind. When you edit, edit like a gentle breeze. HALLIE: Jim will be checking in today so please, if you have any comments or questions, join the discussion! And tune in tomorrow to join the conversation with the amazing Jane Friedman, former Writers Digest Books publisher, who truly is what she bills herself: "the most progressive media professional you'll ever meet." We'll be talking about how some literary agents are adapting in order to survive in a changing publishing industry. Ah, New Year's and champagne. I remember a New Year's Eve in the late 1980s on the rooftop of the Canadian Embassy in Bangkok. Champagne flowed like a melting glacier. Elegant people and chatter, a backless blue jersey dress I never wore again, humidity, and the lights of the city sparkling below us. I didn't meet the love of my life, but I forged some lasting memories. (Should have put this in dialog to fit the post, but that would've taken too much effort, pre-caffeine). 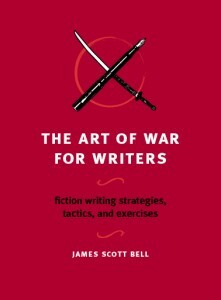 Just another plug for Jim's books on writing, including his latest, The Art of War For Writers. An encouraging book for writers at all levels. Looking forward to your next novel, Jim. Laura, I want to read that book!! Hallie--It's funny what triggers a memory, isn't it? Now, if only I can find a way to get my Colorado Springs PI or my Georgia hair stylist to Thailand . . .
Glad to have uncorked some memories, Laura. Mark, thanks for the kind words about The Art of War for Writers. And Hallie, thanks for hosting me here today to talk about dialogue. I love teaching it to both novelists and screenwriters, because it's the fastest way to improve a manuscript. Oh,Jim, such perfect timing. And I am late to the party since I had to write today--GOT to write today--and am now catching up on line. I've changed from first person--where use of dialogue seems so natural--to third person, where I'm still trying to learn how to make it be seamless and graceful. People say--oh, write it in first person, then change to third. But that doesn't quite work for me--unless I think "what does the character want here, what's the point"--that helps. But when it comes to dialogue in a third person story--any thoughts? Or am I just over-thinking and interfering with the wind? Hi Hank. When writing in 3d, you have to do different voices, of course. I like to have a) a visual of my characters, via Google images; and b) a "voice journal" which is a free form, stream of consciousness document of the character talking to me, prodded by my questions. I do this until I can "hear" them in their voice.